These chewy pumpkin spice cookies are sure to be a hit with your paleo + vegan friends as well as gluten eaters! This recipe also has a low-carb option. I’m guessing a lot of people are over pumpkin for the year but I’m definitely not. If you’ve moved on to all things Thanksgiving, check out my paleo apple crisp, cranberry orange sauce or gluten-free pumpkin pie bars. Does anyone have any Thanksgiving recipe requests? I’d be happy to have some suggestions! Now on to these cookies. I’ve been working on a paleo pumpkin cookie recipe for over five years. I want them to be super chewy but chewy and pumpkin cookies don’t seem to go together. I’ve made other pumpkin cookie recipes that were supposed to be chewy, but I thought that they were still cakey. As some of you who have been following me for a while might know, I’d rather not post a recipe than compromising on quality. So yeah. I’m done with pumpkin cookies! 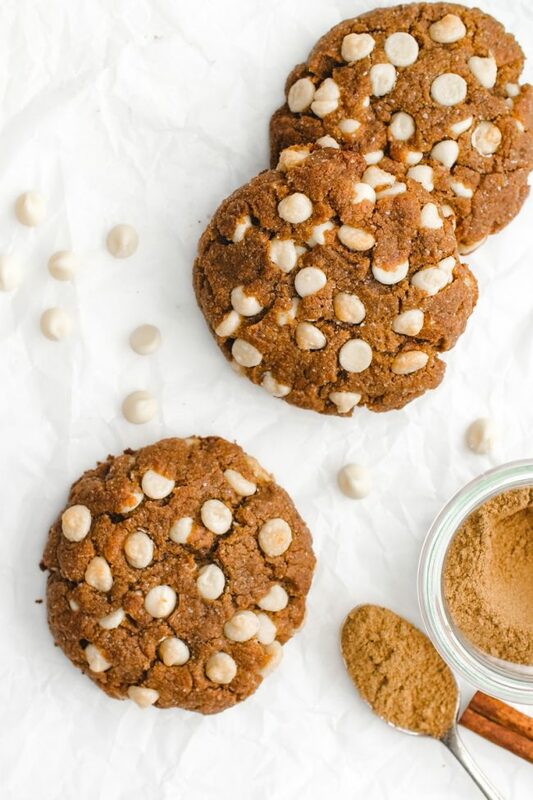 So today I’m bringing you the next best thing – pumpkin spice cookies. :) I wouldn’t say that these cookies are super spicy. If that’s what you want, try my paleo gingerbread cookies, which have a similar base to this one. 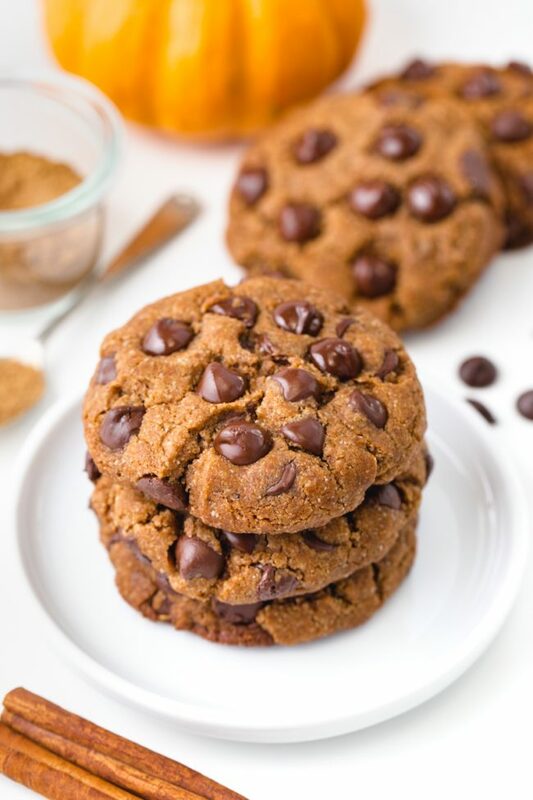 Some espresso powder in these pumpkin spice cookies would be a delicious addition! Maybe 1/2 – 1 teaspoon? I make mine with a chia egg but they’re great with a regular egg, too. 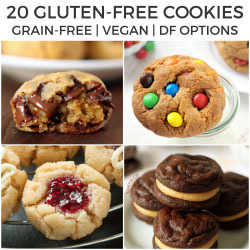 Make sure to use dairy-free / vegan chocolate chips, if needed. There are vegan white chocolate chips but they’re far from paleo. A flax egg should work. I haven’t tried anything else, though, so I can’t say for sure. Yes! Make my coconut flour cookies and add 1 tablespoon of pumpkin pie spice. Can I use something instead of coconut flour? Nope! There’s no sub for coconut flour. They work great with sunflower seed butter. 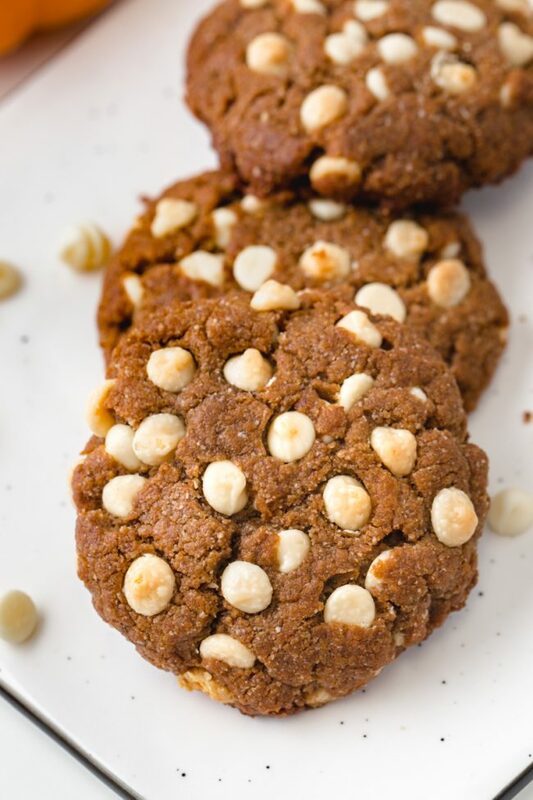 I haven’t tried any other nut butters so I can’t say for sure that these pumpkin spice cookies would come out as well as with almond butter. My guess is that they wouldn’t. Whatever you use should be free of added fat and sugar. In a medium mixing bowl, stir together the almond flour, coconut flour, baking soda, pumpkin pie spice and salt. Set aside. In a large mixing bowl with an electric hand mixer or using a stand mixer, beat together the coconut oil, coconut sugar, almond butter and vanilla at medium speed until well combined, about 1 minute. Beat in the egg on low and mix until well incorporated. Then stir in 1 cup (170 grams) chocolate chips. Place the bowl in the refrigerator for about 1 hour or until the dough is firm. Roll the dough into 8 (75-gram) balls and place the remaining 1/4 cup (43 grams) of chocolate chips on the top and on the sides of the dough balls. Place 4" apart on the prepared baking sheet. Press the cookies down lightly with the palm of your hand. If you use slightly melted coconut oil, the dough will be greasy and the chocolate chips will be hard to incorporate. 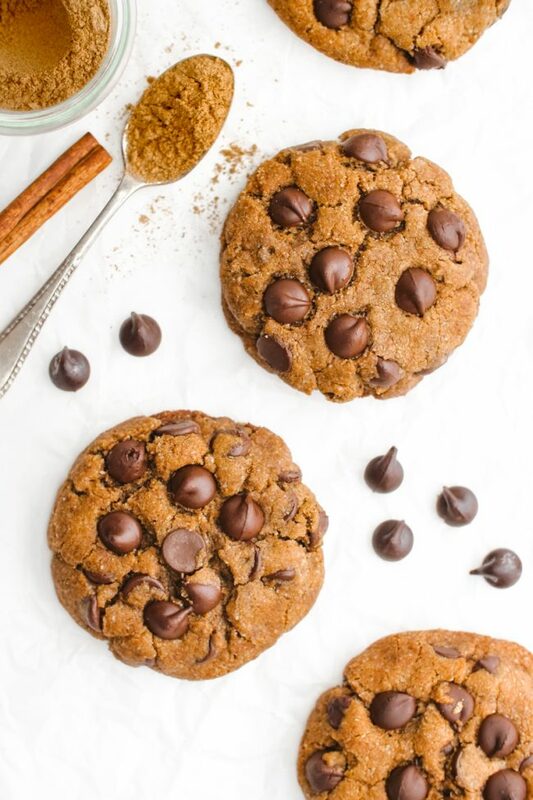 24 comments on “Pumpkin Spice Cookies (paleo, vegan, low-carb options)” — Add one! GREAT RECIPE!, I LIKE THAT YOU CAN DO IT PALEO & DAIRY FREE. What brand of paleo chocolate chips do you use? Every chip I have found at the store is not paleo friendly. Has some sort of paleo forbidden sweetener or a forbidden gum substance. The only thing I have found so far is cacao niblets which would be very bitter. Most people consider Enjoy Life Chocolate Chips to be paleo although I know some insist they’re not. These look so big and thick – my kind of cookies! I think I have most of these ingredients on hand, but definitely need to pick up some almond butter. I love how many chocolate chips you use in these cookies! They look so tempting I wish I could reach into my screen and eat them! I need to find a nut/seed butter alternative – what about coconut butter? Thanks! And hmm. I’m afraid that coconut butter would make them a bit crumbly. :/ I tried it a long time ago while trying to make an AIP version of these cookies. I wish there were a good sub for nut / seed butter! Wow so delish!!? Such chewy, yummy goodness. They freeze beautifully! Thank you for all your amazing recipes! Have had great success with many! Mistake on the question mark at the end of delish…should have been another exclamation lol!!! Oops (I’m new as you can tell)haha forgot to rate! Can’t tell where to do this but 5 hearts obviously! Woohoo! I’m happy to hear that you’ve been enjoying the recipes! And great to know that these freeze well. :) Thanks a bunch for your comment! I am allll about pumpkin spice season! I’ll have to whip up a batch of these cookies. Thanks for including a vegan option :) I appreciate it! Made these today… Children loved them! Delicious cookies for a fall and winter treat ! Thank you! Thank you! You’re welcome! I’m very happy to hear that your kids enjoyed them. 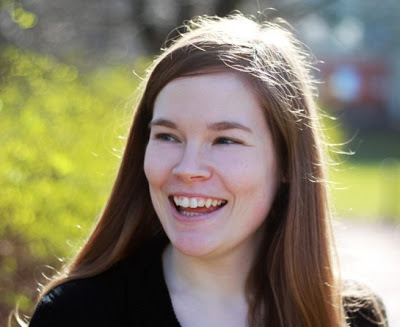 :) Thanks for your comment! excellent!every recipeyou post is simply the best! I love pumpkin spice! These cookies look so delicious!